Sedges don't seem to get much respect in the botany community, and I'm guessing one of the reasons is because they're just so gosh darn hard to identify! There are very few species that are immediately recognizable, and since there are 600 species alone in the genus Cyperus (there are about 5,500 species in 109 different genera in total), that's a lot of unknowns! I, for one, steer completely clear of photographing sedges unless I'm happy just calling it a sedge since the task of identifying it seems daunting to me. One of the clear exceptions to this rule of mine (behold: the photos!) isn't just because it's identified in the greenhouse by a little tag. No, I could have identified this one all on my own. This is the umbrella papyrus! 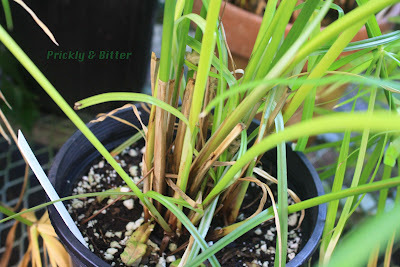 It's the single most popular sedge in cultivation as an ornamental plant (yes, even more than the "real" papyrus...more about that later), often planted in North America as a pond plant. It is originally native to Madagascar (not Egypt like you may immediately think based on its common name), one of thousands (possibly hundreds of thousands) of species native to this rather small island. At one point in time, before humans decided that Madagascar was a nice place to live and that crop plants did well there, it was completely covered by rainforest and savannah, and probably housing the most biodiverse population of endemic species on the planet. 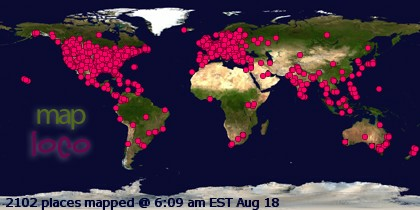 But, alas, we're good at destroying things. Now the entire island of Madagascar is almost completely deforested, and most species originally from there are threatened, endangered, critically endangered, or extinct according to the IUCN. If you want to see all of the beauty that Madagascar has to offer (at least, botanically speaking), you might want to go visit sooner rather than later. It's on my "bucket list" of places to go! Many people have heard of papyrus, but a different species (even though this species is often mistakenly labeled as "THE papyrus"). Cyperus papyrus is a very closely related species but easily distinguished by the feathery tuft of leaves at the top of the stalk, unlike the umbrella-like tuft at the top of the stalk of this species. 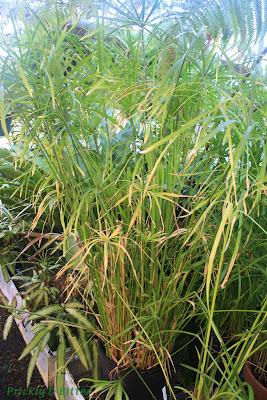 The stems of the true papyrus (and sometimes this species) are soaked in water until easily pliable, then woven together to make a type of mat. This mat is put on a nice warm, flat rock in the sun and then beaten with another smaller rock to beat out the water and squish all of the fibres in the stem together. 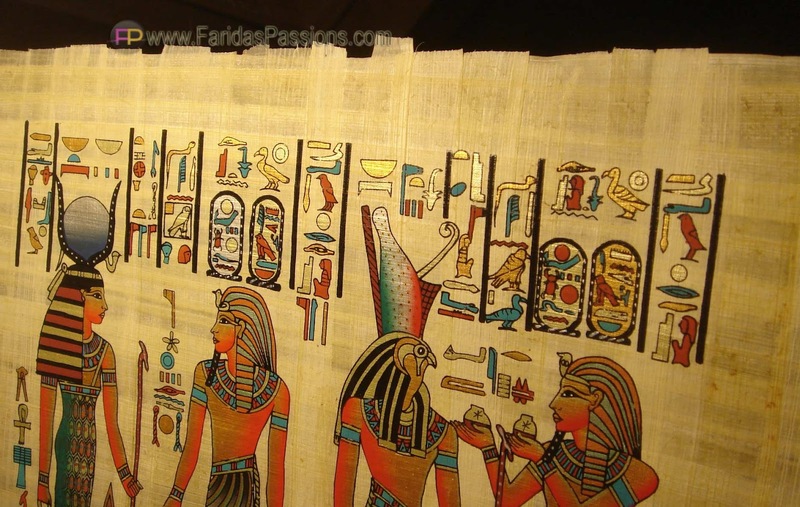 Once the stems adhere to each other, the sheet of papyrus is peeled off the rock and hung up to dry. 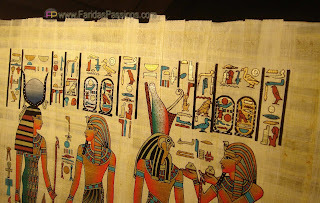 The resulting product, papyrus, can then be used like paper or other material for writing out documents or making paintings. This, however, is not paper. Paper is made from a slurry of fibres of any plant origin (you can make hemp and cotton paper, so the fibres don't have to just be from trees), so the traditional method for making papyrus isn't the paper-making process. Confusingly enough, the word "paper" is derived from "papyrus"; they are two completely different things even though the end use might be the same. 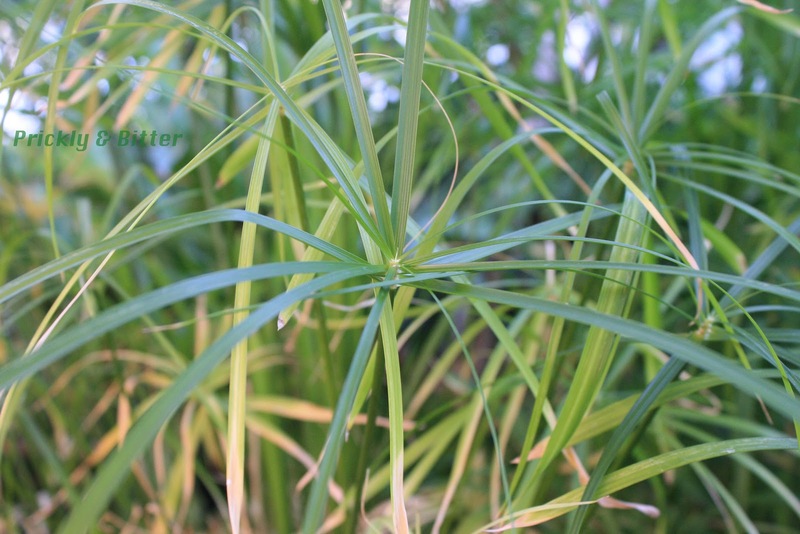 As you might be able to tell from the middle photo, the bottom of the stems and the way that Cyperus grows is very similar to a grass. Grasses and sedges are all in the same order of plants but in different families (same with rushes). The way that I was taught by my supervisor to tell them is apart is the rhyme "sedges have edges and rushes are round, grasses are hollow" (OK, so the rhyme breaks down at the end but you get the idea!). When viewed in cross-section, the stems of sedges are triangular.